We'll now discuss all parts of the game between missions. 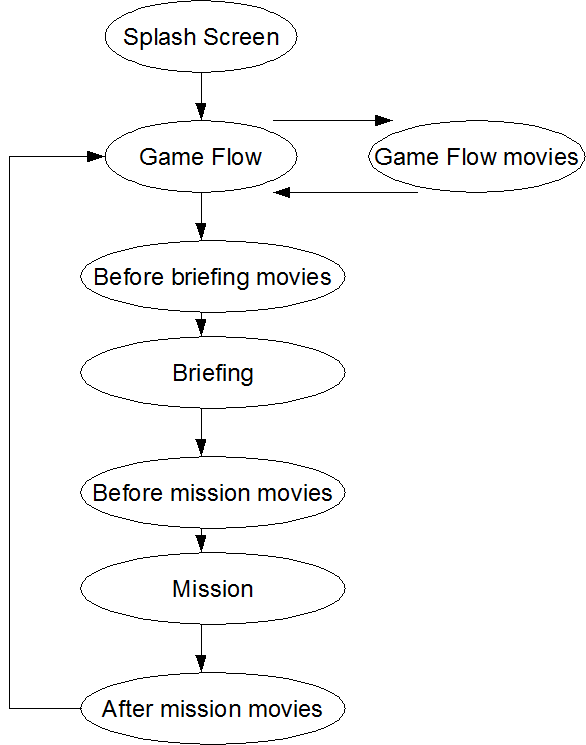 This includes the game menus(the gameflow), and the movies played between mission. The gameflow is fully customizable. The gameflow consists of several rooms. Above, we see one particular room in the gameflow. You can customize the appearance of every room, and add as many rooms as you want. Additionally, some hotspots can display an animation. An animation is a series of images, displayed on top of the background. The doors that open as you move the mouse over them are an animation. Additionally, music and sound play in the background. The gameflow consists of many rooms, followed by paneltext, followed by music. Each room can contain many hotspots. We'll cover the rooms later, but first, let's hit a few easy topics first. controls the color of menu text. Each of r, g, and b are on a scale from 0 to 1.0, and represent red, green and blue. Most paint programs are on a scale from 0 to 255, so just divide the paint program's number by 255 in a calculator. In the main gameflow, there are actually 2 music files playing simultaneously. The music file. The is controlled by the attribute named default_music. Some background chatter, representing some voices coming in over an imaginary intercom. This is controlled by the attribute background_sound. Additionally, a different music file plays during a debriefing, and this is also controlled in the gameflow.xml file. For a winning mission, the sound specified by debriefing_good_music will be played. On a losing mission, debriefing_bad_music will play. Remember, you can add as many rooms as you like. A room itself consists of many hotspots, and a background image. The background image should originally be sized 640x480. Keep a backup of the original image, we'll need it later. Keeping the original image in the lower left hand corner, you'll need to put empty space around the right and top of the image, so that it's new size is 1024x512. This is because OpenGl requires images to be sized to a power of 2. Do not stretch the original image as you do this resize. mouseovertext: This optional attribute specifies the text that will be displayed when the player moves his/her mouse over the hotspot. rect: The area containing the hotspot. To determine this open up the original 640x480 background image in an image editing program. The rect specifies the upper left corner of the hotspot. In this case, the upper left corner of the screen is 0,0. Here is an example of a changeroom command. You'll notice the additional param attribute. If the command is a changeroom, the parameter specifies the room that the player moves into. The first room in the gameflow.xml file is room 0. Plays a movie. We'll discuss this later. This hotspot is a door. When the player moves the mouse over the hotspot, the sound "door.wav" is played, because of the sound attribute. Additionally, note the animation parameter. This is used to display an animation. An animation is a sequence of images. fps: The speed at which the images change. This is short for Frames Per Second. 8 is a reasonable number. x and y: Refer to where to place the lower left hand corner of the animation. It may take some trial and error to get the position correct. Note that all animation images, must be .png files with alpha channels. They must be a power of 2 in width and height, but you can use the alpha channel to exclude any extra parts around the top and right. Optionally, you can also use the loop attribute to force the animation to cycle. Otherwise, it will go forwards when the mouse is over, and backwards when the mouse is moved outside of the hotspot. You can now play movies, and even choose which movies to play for each mission. The following diagram shows the various phases of the game. During the gameflow. This would be used for conversations with characters, before the player chooses to start a mission. Now, most customization will involve lua scripting. All Flight Commander scripts are done in the Lua scripting language. The book Programming in Lua is a good introduction. Note that when editing outside of a mission, only certain functions are available. To customize the movies for a particular mission, you need to create a file mission_name.gameflow.lua. For example, if your mission is named A1.mission.xml, your new gameflow script file must be named A1.gameflow.lua. Then, you must define at least the following four functions, even if they are empty. 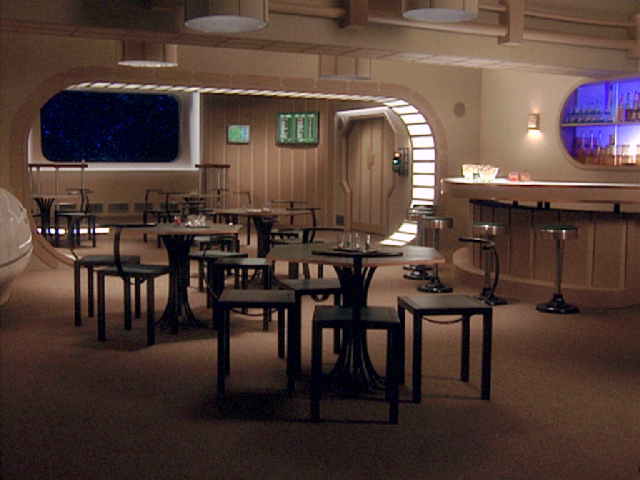 This sets up the inital room to use for the mission. You might want to change the initial rooms to add more hotspots for new character conversations, for example. This changes the voice that runs in the background. In the next series of functions, you're allowed to play movies. You can choose which movies to play based on saved variables for example, which are available for your use. You can also add movies to AfterMission. In addition, to saved variables, aftermission has access to serveral variables from the mission that just completed. and are documented in the gameflow scripting reference. Note that if you do not provide a mission.gameflow.lua file, the game runs default.gameflow.lua instead. This serves to run the default movies if you have not specified special movies for a particular mission. The functions within default.gameflow.lua are similar to the ones mentioned before, except they begin with Default. You are free to edit any of these default functions yourself. You are also able to call any of these functions from within your own mission.gameflow.lua file, if you'd like to use the defaults in certain cases only. Besides playing movies before briefings and before and after missions, we can show players some movies in the middle of the gameflow. These movies are played when the player clicks on a hotspot. to play Stiletto's movie at the right time. Where moviefilename is an avi file and mp3filename is the name of an mp3 file. Adds a fullscreen movie. Can be called in any gameflow script function except startup. Where room is a room within gameflow.xml. This is used to start off a particular mission in a different room. This is useful for changing the room background to add an additional hotspot for a character conversation. The first room in gameflow.xml is 0. This function can only be used within startup function. Where mp3filename is the name of an mp3 sound file. During the gameflow, a background voice is played. The sound can be changed by calling this function. This can only be called in the startup function. This is useful if, for example, you'd like to play a scramble voice in the background for certain missions. is normally chosen from the campaign.xml file. However, if you want to override the campaign.xml file, this is the way to do it. This variable is only valid within an afterMission function. The variable can have one of the following predefinted values. This variable is only valid within an afterMission function. This variable shows how damaged the player's ship got during the mission. 1.0 means the ship is practically destroyed, 0.0 means the ship has no damage.